For those who want to get a new credit card, especially if there is an emergency situation where you need access to credit funds quickly, the wait for approval can be quite frustrating. First you have to fill out an application and then mail it in. After that you have to wait for the lending institution to make a determination of whether or not you are approved then wait several more days to receive your card if you were. This entire process is tiresome and frustrating and can really cause an issue if you are waiting on a credit card for something important. However, there is a way around this entire waiting process and that is with instant approval credit cards. Instant approval credit cards are pretty much what it sounds like. Instead of going through an entire process of mailing in an application and waiting, you instead apply online. All the wait time is avoided and you get an answer of whether or not you are approved within seconds. Instead of an application you manually fill out and mail in you complete an online application form. You are required to read the terms of the credit card and agree to them before submitting your application. Once you hit submit your credit score is automatically drawn and a determination is made as to approval. If you are approved a credit card will be mailed to you as soon as possible. However, if you are declined, you will receive notice and a letter explaining the reasons will be mailed to you. How Does the Instant Approval Application Work? First you will go to a site that offers instant approval credit cards. Make sure that it is a well known credit card and not one of the private credit cards that require you to purchase items only from their catalog of items. Then, you will answer questions similarly to applying for an offline credit card. Make sure you have all the information required prior to starting. You will need to answer questions such as name, address, previous addresses, employers, salary, social security number and sometimes even references. Having all this handy already will make the process go a lot smoother. Make sure you are using a secure site to fill out the information because you will be submitting personal, confidential data. You will see https:// in the address bar and a padlock symbol indicating you are accessing a secure site. Once you have your application filled out you may need to determine other options such as if you want a second card or if you want to carry insurance in case of illness, loss of employment or death. Once you have all the information together and filled out, submit the form. Typically you will receive an answer within 60 seconds, often less. 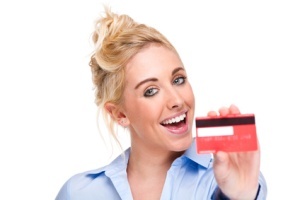 Instant approval credit cards are advantageous because you get an answer quickly. However, the downside to this is there are no special considerations. The approval process is typically granted based on a matrix that includes your credit score. If you have good credit and a solid source of income you are likely to be approved for the card. However, if your credit is less than stellar you may not be approved at most traditional credit card companies. But, this does not mean you will be declined everywhere because there are instant approval credit cards that are designed specifically for second chance credit or for those who may not have the credit score necessary for traditional sites. One of the ways to avoid any undue delays in getting instant approval credit cards is to keep up with your credit score by tracking your credit report regularly. This way if there are any issues with your credit score you will be able to correct them quickly before you run into any problems with instant approval credit cards. You can also make sure you bolster your credit rating and make payments on time to improve your chances of getting a positive answer for instant approval credit cards. It is a good idea to check your credit report monthly or quarterly at a minimum to stay on top of it. If you have less than stellar credit but want to apply for instant approval credit cards you actually do have a few options. For those who are trying to rebuild credit and may have had some difficulties but no recent problems you may be able to get second chance credit with instant approval credit cards. However, these credit cards are typically charged at a high interest rate and have a very low credit limit. This is to mitigate the risk. However, if you use them properly, charging a few items every month and paying it off regularly, you can build your credit rating and possibly raise your limit and reduce your interest rate. There are other instant approval credit cards that are used primarily for those with very poor credit. You may receive instant approval but they are typically not unsecured credit cards and are instead secure cards. This means they require you to make an initial deposit with them. The amount of the deposit you make will be equal to or a high percentage of your credit limit. This way, if you default on the card they are not out any money. Usually the deposit is returned after one year of successful payments and your secure card becomes an unsecured card, further assisting with building your credit back up. For anyone who wants to avoid the long wait times for applying for a credit card by traditional means instant approval credit cards are the way to go. For those with excellent credit, instant approval credit cards are usually a sure thing. However, for those who have credit problems finding instant approval credit cards may be more difficult though not impossible.